Growing up, political science and public policy major Fernando Martinez ’19 would watch movies about college and note the camaraderie of fraternity life. “I knew I wanted that experience when I got to college,” says Martinez, who today is a member of Kappa Sigma Sigma and who served as Inter-Fraternity Council president for the last fall’s semester. Social Greek life has existed at Redlands for more than 100 years, and for Redlands students, the appeal of Greek organizations lies in being able to enhance leadership skills and alumni connections, perform community service, and excel in academics within an established, close-knit brother- or sisterhood. 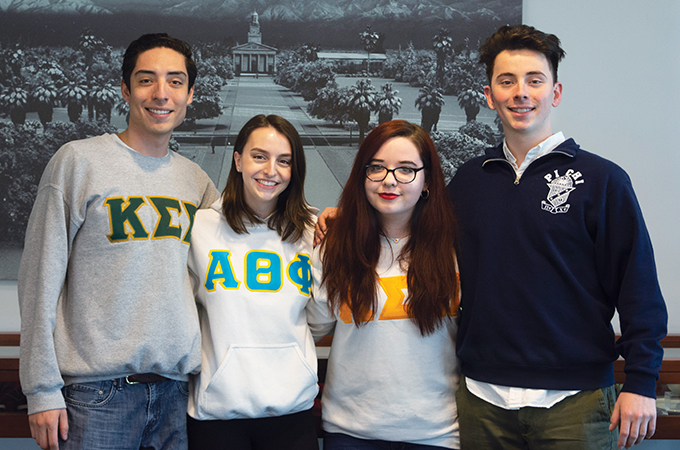 Greek organizations at U of R are local (unaffiliated with national chapters), so fraternities and sororities do everything—set up events, fundraise, and recruit—as standalone chapters. Members believe that local organization leads to stronger traditions, more loyalty, and enhanced mentorship, as well as the freedom and responsibility of self-governance. Greek Council leaders such as Moorehead and Martinez act as liaisons between their organizations and the administration, co-hosting weekly Greek council meetings, and making sure Rush—a biannual event in which sororities and fraternities recruit new members—goes smoothly.